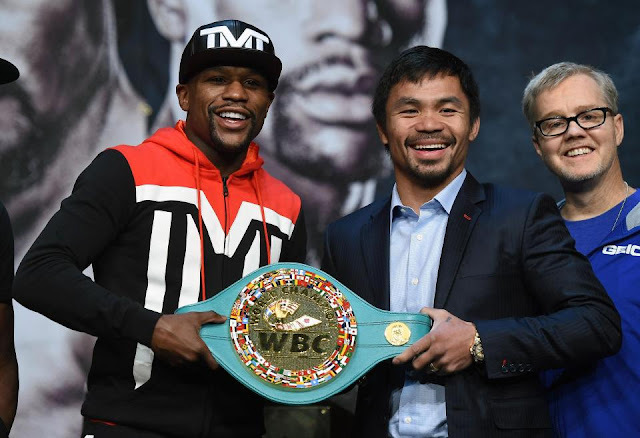 Will Floyd Mayweather rematch Manny Pacquiao? One of the top stories in the boxing word this week is about Manny Pacquiao who rolled back the years to beat Adrien Broner in style, and then decided to challenge Floyd Mayweather to a rematch. Manny Pacquiao convincingly beat Adrien Broner in Las Vegas on Saturday and issued a come-and-fight-me plea to retired boxing champion Mayweather who was sitting ringside at the time. Floyd Mayweather has not fought professionally since his 10th round stoppage victory over the UFC fighter Conor McGregor in 2017. Since then he has contested an exhibition fight against the Japanese kickboxer Tenshin Nasukawa, who he obliterated in a single round on December 31. Though the exhibition was far from an official contest, it sparked rumors he was considering a return to sport. "Floyd Mayweather will not be coming out of retirement to fight Manny Pacquiao again because he does not have the motivation to do so." said Mayweather Promotions CEO Leonard Ellerbe. Ellerbe was speaking shortly after Manny Pacquiao had just beat Adrien Broner in a welterweight fight in Las Vegas, which had reignited rematch rumors. But Manny Pacquiao has continued his campaign regardless. "Come back to the ring and we can fight again," the 70-fight veteran said. A rematch could be worth hundreds of millions of dollars to both fighters, but Ellerbe said "it's not always about the money." what do you think, will there be a rematch between Floyd Mayweather And Manny Pacquiao? BongoToday.com - Entertainment and Lifestyle : Will Floyd Mayweather rematch Manny Pacquiao?